Courtesy of Margaret & Cyril Granger. 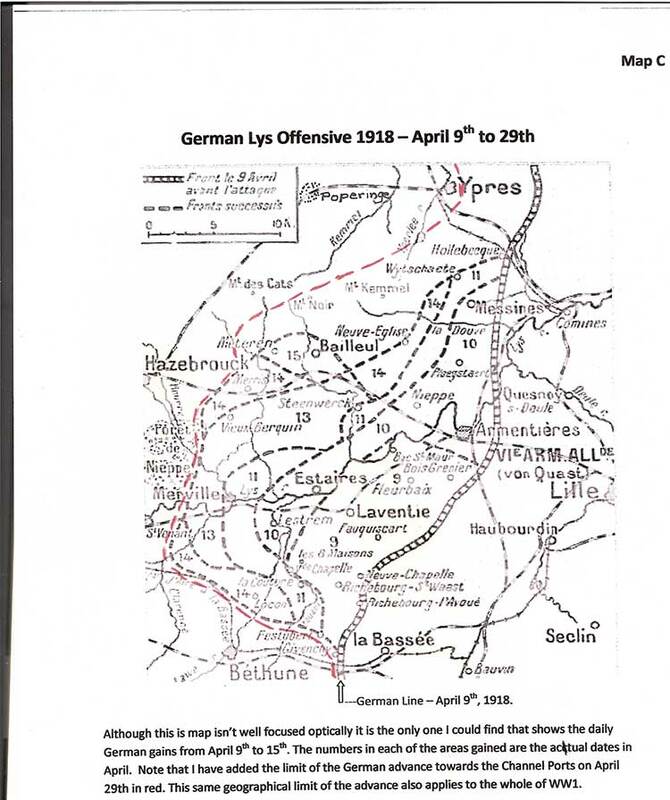 Fourth Battle of Ypres (Battles of the Lys); April 9 to 29, 1918. The German Army advanced to the west but Ypres was not captured. A Flanders offensive by the German Army was originally proposed in October 1917 by the Army Group Commander Field Marshal Prince Rupprecht of Bavaria as a large-scale attack either carried out on its own or as an attack to relieve pressure elsewhere on the German Front. Rupprecht's Army Group consisted of four German Armies holding the German Front in Flanders and Picardy; his command covered the Belgian coast to Ypres and on to Armentieres, from there through Artois to the east of Arras and southwards to St. Quentin on the river Somme. In the original October 1917 plan the operation was given the codename of “George” and plans were submitted for an offensive on the Flanders Front between Ypres and Bethune. The breakthrough would be made in the British Front just south of the Belgian-French border in the Lys river area with the intention to pierce the Allied Front there and advance westwards making for Hazebrouck. This would cut the British Second Army holding the Front north of the Lys river away from the British First Army holding the line in Artois. The British-held rail centre of Hazebrouck would be captured and the British troops in Belgian Flanders could be pushed westwards and trapped on the Belgian coast. The operation would, however, only be possible to start from April at the earliest due to the high winter water table of the Lys river. The ground would not begin to dry out until the warmer spring weather arrived in April. Between November 1917 and January 1918 the plans for a German offensive against the Allied Front in the spring of 1918 were developed. By January 1918 the German Supreme Command confirmed that the offensive would take place in a series of attacks rather than one great anihilating attack. Operation “George” was reduced in scale, renamed “Georgette” and timed to be launched in mid April after the first blow had been dealt to the Allies with the “Michael” attack in the Somme region from 21st March. After initial success in breaking through the British Front Line and advancing several miles into Allied territory, the German Armies taking part in the “Michael” operation were held at a line east of Amiens. The German troops were exhausted, lines of supply had proved difficult to maintain across the shell-damaged ground, food was in short supply for men and horses. On 5th April the German Supreme Command sent a message to German Army Commanders that Operation “Michael” was terminated. In the early morning of 9th April the German Fourth and Sixth Armies launched the Flanders offensive, operation “Georgette”, the second in the planned series of attacks on the Allied Front for spring 1918. South of Ypres the Portuguese troops holding the Allied Front in Artois were pushed westwards by four miles. In the south of the Ypres Salient sector the British Second Army was pushed westwards also, losing its hold of the Messines Ridge, Wytschaete and Messines villages which had been captured from the German Army in June 1917, just under a year before. The village of Passchendaele, captured by the Allies after such hard fighting during the Third Battle of Ypres, was retaken by the German Army on 16th April. South of Ypres the German advance was held at Kemmel Hill (Kemmelberg). However, a German attack on Kemmel Hill on 25th April succeeded in pushing French troops, recently arrived in the area as reinforcements, off this important high ground. The Georgette operation continued for another four days but was terminated on 29th April with no more significant German gains and without the capture of Hazebrouck. German forces break through the Allied Front to Éstaires, causing very high casualties to two Portuguese divisions. A German attack with the intention of capturing Hazebrouck is stopped by the Australian 1st Division. French reinforcements are sent on their way to the British sector, specifically the Kemmel sector south of Ypres, to help stem the German advance. Passchendaele is reoccupied by German forces. The British repulse a German attack on the high ground of the Kemmelberg. German forces attack to capture Béthune but are unsuccessful. A French division arrives at the Kemmelberg to relieve the British defenders. However, the German forces attack and capture it from the French. A German attack captures the Scherpenberg heights to the north-west of Kemmelberg. This battle was also known as the Advance in Flanders or the Battle of the Peaks of Flanders. Unofficially it is sometimes known as the Fifth Battle of Ypres. On 28th September 1918 the Allied Army Group of Flanders attacked and broke through the German Front to the north, east and south of the city of Ypres. This Allied Army Group comprised British, French and Belgian divisions and was under the command of King Albert I of Belgium. Casualties were over 4,500 for both the British and the Belgian forces. The progress of the advance was significant, with the recapture of the Kemmelberg and several miles of territory lost to the German advance in April earlier that year. Messines is retaken by British forces. Passchendaele is retaken by Allied forces. The Allied advance to the west, pushing the German Army further away from Ypres and the destruction left in the area from four years of fighting, continued with the Battle of Courtrai. The German plan was to smash through First Army, push Second Army aside to the north, and drive west to the English Channel, cutting off British forces in France from their supply line which ran through the Channel Ports of Calais, Dunkirk and Boulogne. The German bombardment opened on the evening of 7 April, against the southern part of the Allied line between Armentières and Festubert. The barrage continued until dawn on 9 April. The Sixth Army then attacked with eight divisions. The German assault struck the Portuguese 2nd Division, which held a front of about 11 kilometres (6.8 mi). The Portuguese division was overrun and withdrew towards Estaires.The British 55th Division, to the south of the Portuguese in a more defensible position, pulled back its northern brigade and held its ground for the rest of the battle, despite attacks from two German reserve divisions. The British 40th Division (to the north of the Portuguese) collapsed under the German attack and fell back to the north. Also on 10 April, German Fourth Army attacked north of Armentières with four divisions, hitting the British 19th Division. Second Army had sent its reserves south to aid First Army and the Germans broke through, advancing up to 3 kilometres (1.9 mi) on a 6 kilometres (3.7 mi) front, and capturing Messines. The 25th Division to the south, flanked on both sides, withdrew about 4 kilometres (2.5 mi). By 11 April, the British situation was desperate; it was on this day that Haig issued his famous "Backs to the wall" order. On 12 April, Sixth Army renewed its attack in the south, towards the important supply centre of Hazebrouck, another 10 kilometres (6.2 mi) to the west. The Germans advanced some 2–4 kilometres (1.2–2.5 mi) and captured Merville, Nord. On 13 April they were stopped by the Australian 1st Division, which had been transferred to the area. The British 5th and 33rd divisions were also moved there. From 13–15 April, the Germans drove forward in the centre, taking Bailleul, 12 kilometres (7.5 mi) west of Armentières, despite increasing British resistance. Plumer assessed the heavy losses of Second Army and the defeat of his southern flank and ordered his northern flank to withdraw from Passchendaele to Ypres and the Yser Canal; the Belgian Army to the north conformed. The Kemmelberg is a height commanding the area between Armentières and Ypres. On 17–19 April, Fourth Army attacked there but was repulsed by the British. On 18 April, Sixth Army attacked south from the breakthrough area toward Béthune but was repulsed. French Marshal Foch had recently assumed supreme command of the Allied forces and on 14 April agreed to send French reserves to the Lys sector. A French division relieved the British defenders of the Kemmelberg. From 25–26 April, Fourth Army made a sudden attack on the Kemmelberg with three divisions and captured it. This success gained some ground but it made no progress toward a new break in the Allied line. More French reinforcements arrived in the latter part of April, the Germans had suffered heavy casualties, especially among the stoßtruppen and attacks toward Hazebrouck failed. It was clear that Georgette could not achieve its objectives; on 29 April the German high command called off the offensive. In 1937 C. B. Davies, J. E. Edmonds and R. G. B. Maxwell-Hyslop, the British Official Historians gave casualties from 9–30 April as c. 82,000 British and a similar number of German casualties. 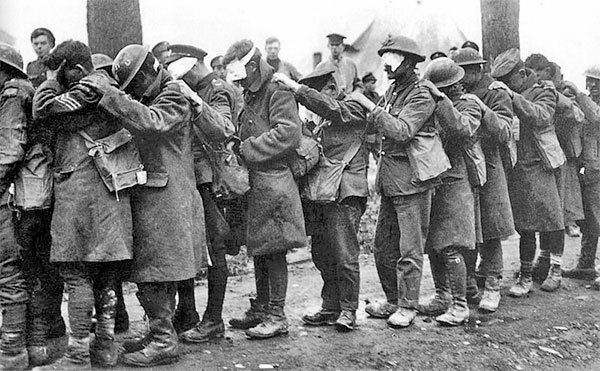 Total casualties since 21 March were British: c. 240,000, French: 92,004 and German: 348,300. In 1978 Middlebrook wrote of 160,000 British casualties, 22,000 killed, 75,000 prisoners and 63,000 wounded. Middlebrook estimated French casualties as 80,000 and German as c. 250,000 with 50–60,000 lightly wounded. In 2002 Marix Evans recorded 109,300 German casualties and the loss of 8 aircraft, British losses of 76,300 men, 106 guns and 60 aircraft and French losses of 35,000 men and twelve guns. In 2006 Zabecki gave 86,000 German, 82,040 British and 30,000 French casualties.